1 Host Web Review 2019: Is 1 Host Web a Good Hosting? 1 Host Web is an Indian web hosting company with servers located in the U.S. They offer a 99.9% uptime guarantee and 24/7 customer service. 1 Host Web is an Indian hosting company with their servers located in the United States. They’ve got a sizable Twitter following and have been active on social media since 2014. Their website and support are available in English. Note that with this provider is that if you’d like a free domain with your hosting, you need to go for their highest-tier shared hosting package — otherwise, you’ll have to pay for the domain yourself. Also, SSL certificates are not included for free, though you can purchase premium ones from the company. They use what they claim to be “the highest quality and spec” LiteSpeed Web Server and cPanel, an easy-to-use and reliable control panel available in multiple languages including English, Spanish, Portuguese, Dutch, French, Norwegian, German, Russian, Ukrainian, and Bulgarian. They have technicians working 24/7 conducting regular maintenance, routine backups, security updates, and other safety checks to ensure your data is secure at all times. Their uptime guarantee is 99.9%, which is monitored by reliable third-party companies and backed up by a Service Level Agreement that’ll refund you credit in the event of downtime past their guaranteed levels. The plans are a little lacking on support for advanced level features and coding languages. However, they do have some nice beginner-friendly features. For instance, there’s Softaculous to install popular applications and software with one click (they don’t specify how many programs are available though) and a website building tool that comes pre-loaded with themes and color schemes — perfect for customers with no prior coding experience. The two base packages are pretty affordable and relatively high in resources. Unless you need more than one domain, the Single Website Hosting with 5GB Disk Space plan comes with unlimited bandwidth and 5 GB disk space, all for an inexpensive rate. If you need to host anywhere from two to six domains, the next tier up includes more than enough resources and is still very decently priced. The highest-tier plan is a little overpriced (although it has great resource quotas): in my opinion, they don’t include enough advanced features for the price point. Plans are available in one, three, six, and 12-month terms. They’re slightly discounted if you purchase a longer term upfront. They also offer a 30-day money back guarantee. The highest-tier plan comes with a free domain, but SSL certificates are always an added cost with this provider. They throw in a free Cloudflare CDN as a nice perk though. Their customer service is available 24/7 by live chat, ticket, and email. They state that phone support is available, but I had a difficult time locating their phone number on their website, so it might only be available to paying customers. They also have various helpful resources on their website such as a knowledge base, server status page, network issues, and announcement pages, although many are only available to customers who have logged in. Overall, they offer a good level of support, excellent business hours, and a good selection of methods to get in touch. 1 Host Web’s features are primarily geared towards beginners. This means new website owners can benefit from excellent uptime, above-average customer service, and unlimited plans, all for a reasonable price. 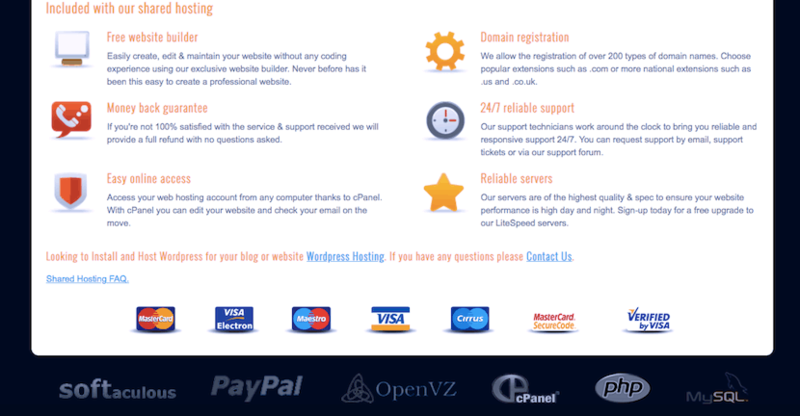 Wondering how 1 Host Web stacks up against other Web Hosting companies? Enter any other Web Hosting company and we will give you a side-by-side comparison.